Here’s another winning recipe from The Grand Central Baking Book. This truly has become one of my go to books, especially for cookies. The instructions are clear, the recipes well-tested and the results delicious! This was my first time making this recipe and it definitely won’t be the last. I’m having a hard time keeping myself from eating them all at once! 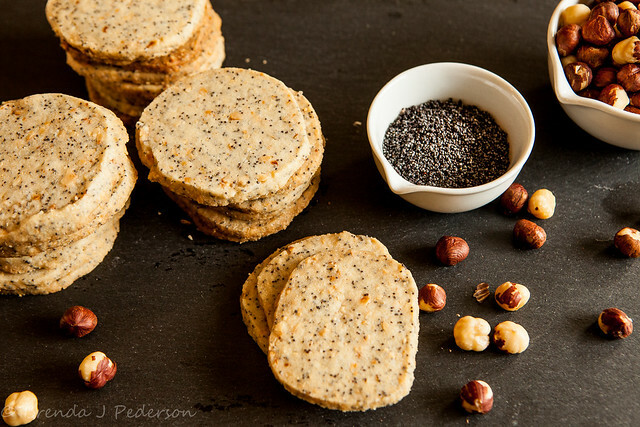 The nutty flavors of poppy and roasted hazelnuts enhance the rich and buttery shortbread style cookies. I made one change to the recipe. Based on the instructions it seemed the hazelnuts are left whole and mixed in. I find that whole nuts can sometimes make it hard to slice rolled cookies. I tossed the hazelnuts into a food processor to chop them up a little, leaving some good size pieces. Also, I have a heavy-duty mixer and it had no problem mixing the nuts into the batter. Measure the flour, poppy seeds, and salt into a bowl and whisk to combine. Using a stand mixer with the paddle attachment, beat the butter and sugar together on medium speed until very smooth, about 3 minutes. Add the vanilla, then reduce the mixer speed to low. Add the dry ingredients and mix just until they disappear into the dough. Fold in the hazelnuts with a sturdy spatula. Shape the dough into two logs 2 inches in diameter, then chill for at least 2 hours and up to 3 days (or freeze for up to 3 months). Preheat the oven to 325°F. Line two baking sheets with parchment paper or Silpat baking sheets. Slice the cookies 1/4 to 1/2-inch thick and place them about 1 inch apart, in 3 by 4 rows, on the prepared pans. Bake for 15 to 20 minutes, rotating the pans halfway through the baking time. The cookies should be firm to the touch. To toast hazelnuts, preheat the oven to 275°F. Place shelled nuts on a baking sheet in a single layer. Toast for 20 to 30 minutes, until the skins crack and the nuts begin to turn golden brown. Remove from the oven and place the nuts in a kitchen towel. Wrap tightly and let sit for 5 minutes or so. (You’re letting them steam a little bit.) Then rub the nuts (still in the towel) vigorously to loosen the skins. You may not be able to remove every little piece of skin, but that’s okay. Remove the nuts from the towel.